This post is sponsored by Ferring Pharmaceuticals. All opinions and love of the app expressed are my own. There’s a time in some men’s lives when they decide to get married and start a family. When that day comes, it’s usually a pretty exciting time. The couple start thinking about nurseries, baby clothes, and car seats. So many things swirl around and there’s a fever pitch of excitement that’s truly unlike just about anything else a person will do (until the day the baby is born, of course). While this planning is just the start of a journey for many, there are a number of couples who’s plans don’t exactly go as smoothly as they would have hoped. 1 in 8 couples struggle to get and stay pregnant and in approximately 40 percent of these couples, the male partner is either the sole cause or a contributing cause of infertility. Regardless of whether male infertility, female infertility or a combination of the two is the cause of couples’ infertility issues, men are often omitted from the infertility conversation. Fertility issues arise and can cause a lot of stress, pressure, and pain. While I have not personally experienced this, I know MANY of my friends and my wife’s friends have. It really is a tough time for all involved and, like with most things, it never hurts to have a little bit of extra help. Many people don’t have the time, money, or geographical access to see a therapist specially trained in infertility counseling. 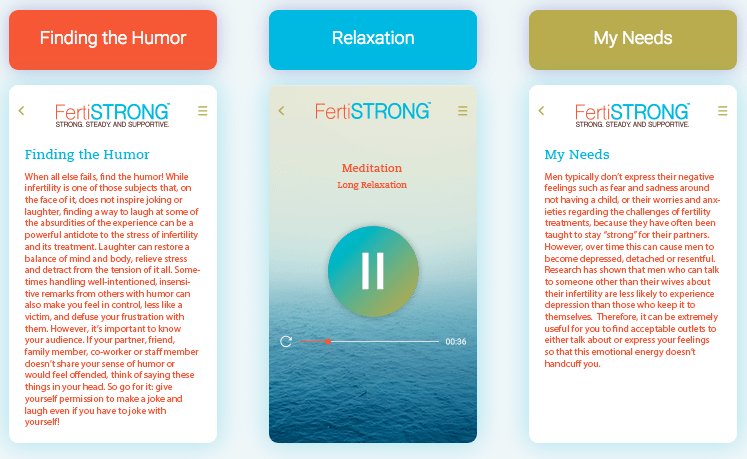 While FertiSTRONG is not a substitute for treatment with a licensed therapist or psychologist, it does serve as a helpful resource for men in the exact moment they feel stress, whenever and wherever they are, by providing them with coping techniques and strategies for many common scenarios faced by men on their family building journey. 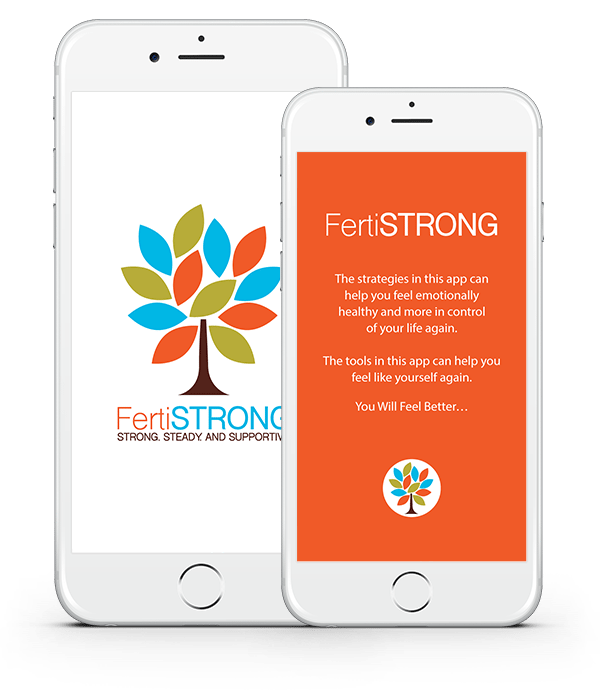 FertiSTRONG is a free mobile app designed by psychologists specifically for men as a resource throughout the emotional journey of infertility. FertiSTRONG provides a variety of more than 500 custom coping options for over 50 specific situations which have the potential to cause distress for men throughout the family building journey. The mobile app was developed to address the unmet needs of men and women trying to build a family. For each situation you might face such as, your body not cooperating when your partner is ovulating or when you need to produce a sample or when your boss needs you to go away on a business trip when your partner is scheduled to undergo a retrieval, you can click on six different ways to help you feel better in the moment. As in, right then when you are experiencing the distress. To give you a bit of background, a survey was conducted last year with RESOLVE: The National Infertility Association that featured insights from more than 100 men and found that they often feel left out of the fertility conversation and don’t feel there are adequate resources available to support them throughout fertility challenges. It just made so much sense to create a resource like this so these men have something to turn to where maybe they would not have in the past. It’s a powerful issue and a powerful response. The creators of FertiSTRONG decided to help. One of the more amazing and impressive things I found with the app is the sheer breadth and depth of the topics and situations it covers. The creators truly want to be there for the users of this app and have tried to think of and address just about everything! Do I have the strength to try again? Giving up/Am I a quitter? Will she leave me for another guy? Can our relationship survive if we don’t have kids? Will I be a second class citizen when baby arrives? Can I/we bond with a donor created child? That’s a very robust list, right? There’s a lot of help packed into this app. Dr. Domar and Dr. Grill are reproductive psychologists with over 45 years combined experience, at two of the most prominent infertility centers in the US. They provide counseling for women, men and couples as they work to build their families. Find out about them and more at FertiSTRONG.com. If you are facing fertility issues, plan on starting a family, or simply want to understand the process and possible complications a little better, it’s time to do something about it! Don’t be afraid to learn more. Feel free to speak up about your fertility issues and experiences. Utilize a resource that may help you on your fertility journey! It seems to me that this app really should be a part of your journey. It’s a really helpful tool when and where I’m sure you feel like you need all the help you can get. Designed specifically for Men Coping for Every Situation…Any time, Any Place, Anywhere. This is going to help so many men. Infertility can be a huge blow to a man, and even when their are options to increase fertility, it can still impact their emotional health. This is going to be a game changer for so many people. So many struggle with fertility issues and they all need to know about this. I can see how the men would feel left out. We tend to think of fertility as a struggle women face, but in reality both persons involved would be emotionally invested! 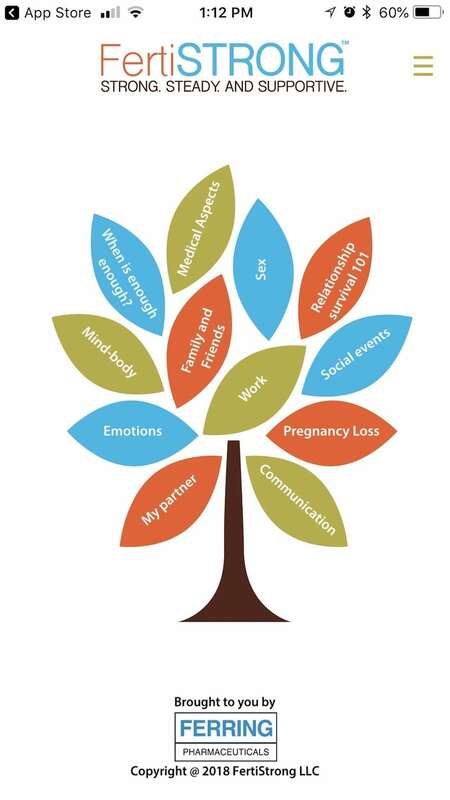 Infertility can be so stressful, and help for it usually focuses on women. This seems like a really helpful resource for men. it’s so hard. i have 2 great girls and have lost one. it’s never easy. i hope this helps countless couples. This app sounds like a great help! Would love to give this a try! This would seriously be a great tool for anyone and everyone. I can not wait to give it a try!